It’s time to get enthusiastic about what you want to do with your life. The Page of Pentacles can indicate the beginning of new ideas or skills you would like to learn specifically aiming at how you can increase your wealth or climb the ladder of success. If you are at a crossroads with a decision in your life related to this you may wish to contemplate if you need further education or training to be able to attain the goal that you are reaching for. Weigh up the skills and successes of your past as you can bring these forward with you into your new endeavour. You need the compass indicated in the coin held in the Page’s right hand to show you the direction you need to go in order to attain the gold indicated at the Page’s right foot. Do not hold yourself back with thoughts of why you cannot have what you desire… the past is behind you as can be seen from the skulls being firming held down with the Page’s left foot. The vibrant red cloth indicates energy that can be used to reach your goal and the key around the neck shows that if you ask the right questions of yourself or of others they may open many doors to help you gain what it is you most desire. If you keep in mind there is no such thing as failure and only lessons that you will learn from any failure you encounter then you can give yourself the best chance at succeeding without fear or negative thinking to hold you back. Good luck in your endeavours and remember the green background in this card indicates growth on many levels. 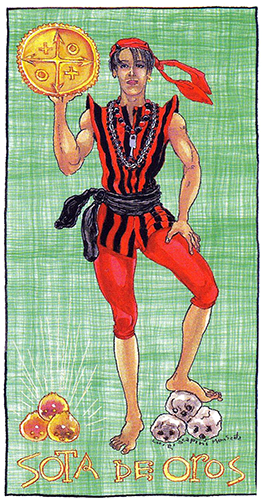 This card is part of the Tarot Lukumi collection, which is dedicated to Santeria, the Afro-Cuban Orisha Spiritual system known to its practitioners as Lukumi. Created by Caelum Rainieri, Ivory Andersen and Raphael Montoliu, the illustrations were done by famed tarot artist Luigi Scapini. Caelum Rainieri and Ivory Andersen are behind the gorgeous Nahualli Animal Oracle and other works and Raphael Montoliu is a gifted and prolific artist in his own right. This deck is currently out of print.